Rapid charge titrations for stability analysis of colloids and dispersions enhance the efficiency of formulation and particle interface analysis. The Particle Interface Potential of particles is measured as streaming / zeta potential and represents the degree of electrostatic repulsion between particles. It reacts to pH, conductivity and polyelectrolyte surrounding, respectively. 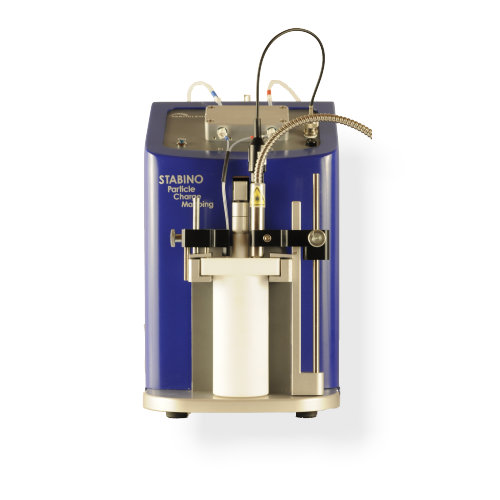 A charge titration with the Stabino® specifies which parameters require special attention. The isoelectric point can be titrated within short time, gathering information on charge density and stable zones, whilst pH, conductivity and temperature are monitored simultaneously. The intuitive tablet PC controlled automatic titration of the Stabino® opens the way to particle charge finger-printing of colloids and dispersions. The isoelectric point is reached quickly, gathering information on charge density and stable zones, whilst pH, conductivity and temperature are measured simultaneously.